Bored! I’m ready for Season 3 to start. 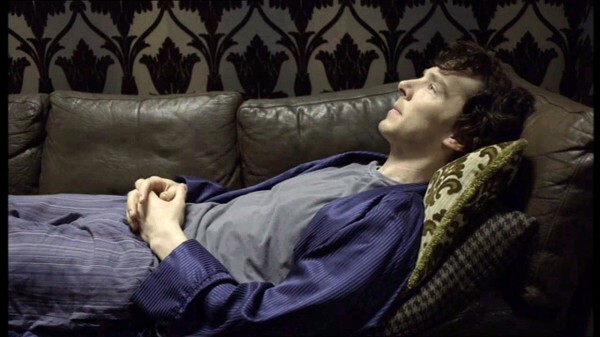 Of course, no one involved in the production of BBC Sherlock is bored right now. They’re all busier than Sherlock in The Great Game! Fortunately, Sherlock fandom is a creative and industrious bunch, so there are lots of things we’re doing and sharing. A good place to start is over at Baker Street Babes (You go, girlfriends!). They’ve got some lovely interviews including a behind-the-scenes with the Sherlock Fan Orchestra (see below) And you can listen to the podcasts while doing other things (like knitting John a sweater; I’m thinking maybe Fair Isle or Intarsia since I loathe knitting cables.). (alas, it’s been far too many years since I played the clarinet or the trombone to be of any value). I’ll be adding some more recommendations to keep us going through the long, dark days before Season 3 arrives. This entry was posted in Captions, Resources and tagged bbc sherlock, benedict cumberbatch, fandom, photo caption, Sherlock Holmes, tv series on August 27, 2012 by JH Watson.